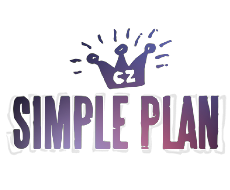 This past Sunday, June 11th, when Simple Plan returned to the Czech Republic – for the Aerodrome Festival, I got to sit down with Chuck Comeau and Seb Lefebvre from Simple Plan (a.k.a. our already established interview duo) backstage and talk to them about a number of interesting topics. We discussed some questions regarding the current No Pads, No Helmets… Just Balls 15th anniversary tour and while talking about the first record, we also delved into the subject of the recording process of this album, which is when the boys revealed some more interesting tidbits from their work with Arnold Lanni. The topic of the future of Simple Plan was also on the table – whether it was regarding the upcoming 6th SP album and how long the process of making it may last, regarding the next live DVD or Chuck’s “pop-punkumentary” Resurgence. I’d like to take this time to thank Simple Plan for taking the time to answer all my questions again, especially Chuck for helping to arrange the interview. Big thank you also goes to Coalition Music management and the Aerodrome Festival promoters for making this interview happen. Please forgive the slightly disturbing background noise, which was caused by the on-going festival (and Machine Gun Kelly starting his set right in the middle of our interview). I will be adding both Czech and English subtitles to the interview very soon.